Several elite athletes have set their sights on the finish line of the 10th annual Marathon Bahamas that gets underway tomorrow. Local Distance runner Oneil Williams will return this the year to defend his half marathon crown and title as The Bahamas’ fastest endurance athlete. Fresh off of winning the Bahamas Half and securing his prize purse, Oneil returned to Kenya to continue his training for the 2019 season and compete in this year’s Marathon Bahamas half marathon. His sights are also set on participating in Haspa Marathon in Hamburg on April 28, 2019 and Kaunas Marathon in Lithuania on June 9, 2019. After transitioning from short distances, Oneil has made impressive improvements in his running history, settling on long-distance events with his specialty being the marathon. Oneil holds The Bahamas’ national record for the marathon in 2:30.35 and the half marathon 1:11.36 and, in 2017, placed second at the Jacksonville Marathon, the highest placing by any Bahamian to date. Also competing in Sunday’s half marathon will be Justin Burrows, a distance runner and triathlete. Justin, who hails from Georgetown, Exuma, became involved in running and triathlons in 2014 and has an impressive resume including qualifying for Boston (2017) and a personal best in the half at 1:19:20. As a triathlete, Justin has climbed the amateur ranks and frequently wins his category and/or places high in the overall standings, and has focused on long course triathlon (Half Ironman and Full Ironman) and also Olympic distance triathlons. In 2018, Justin qualified for and competed in the Ironman World Championship in Kona, Hawaii and posted a 9:45:36. Some of his most notable Ironman performances include a 9:43:18 at Ironman Florida in 2016; a 9:15:31 at Ironman Maryland the year after 2017; and 8:51:16 at Ironman Texas last year. Justin said he is exceptionally excited to participate in his first race, in his home country, at Marathon Bahamas. Wanda Gau, who will be competing in Sunday’s full marathon has placed in the top ten, two times out of her three appearances at the renowned Boston Marathon. She has won the Lake Wobegon Trail and Light at the End of the Tunnel Marathons, and pegs those wins as overall female, as two of her greatest. She has run 38 marathons to date and ran a personal best (3:03:30) this spring at Grandma’s Marathon in Duluth, Minnesota. Wanda has also clinched 34 Minnesota age records in all distances in the past few years and has earned Minnesota Runner of the Year in her age group five times in the past 6 years. “I am very excited to compete in the Bahamas marathon in January so I can escape my cold Minnesota home and see the wonderful sights of the Caribbean,” she said. Alice Henley, a seasoned distance runner and ultra marathoner will be competition in the half marathon this year. She began her distance career at Nova Southeastern University where she ran cross country and dabbled in track. At the end of her college career she decided to take on her first marathon. “I qualified for Boston on my first shot in the A1a marathon,” she said. That win set the stage for Alice to begin to compete soon a grander scale. She has competed in about a dozen marathons, an Ironman, numerous triathlons, half marathons, 5ks, 10ks and everything between. 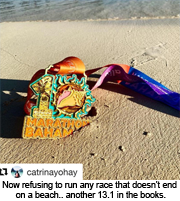 “I feel so blessed to be able to see the world on the courage of my own two feet and lungs, and that is what running the Bahamas is about for me; being grateful to run in the moment and take it all in,” she said. Also lining up Sunday to compete in the Half marathon will be Katalin Nagy, a local resident, who is also an ultramarathoner. Katie completed the 24-Hour Run World Championships in Italy in 2015, running astounding 151.9 miles within that 24 hours, and earned the individual World Championship title on top of the team Gold Medal for Team USA. And She won the 2015 Spartathlon in Greece by improving on her 2014 results with almost four hours. In 2017, Kati became a bronze medalist at the 24-hour World Championship running the 155+ mile event, helping her team to capture the gold. Katie continues her training in the Western District of New Providence. Also competing in the half marathon is Nacho Hernando from Madrid, Spain, who started his running career six years ago, but does not run for a living. Nacho says he runs because it is his passion. But his six-year running career has landed him first place in his age group in the Snowshoe World Champion, fourth overall and third place on the national team this year. 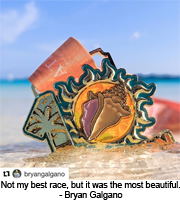 Last year he was the overall winner in Escape to Miami Sprint Triathlon, fourth place overall at the Snowshoe World Championships, first place in his age group and first on the national team. Nacho said his goal for 2019 is to have a personal record in a half marathon.